Robbie Keane scored twice as the Republic of Ireland eased to a 5-0 win over a Tuscan Select XI in Pistoia. Keane's first-half double either side of Simon Cox's strike eased the Republic out of sight by the break. Substitutes Shane Long and Jon Walters completed the rout in the second half. The teams observed a minute's silence before the friendly in memory of the victims of Tuesday's earthquake, tremors from which were felt in Montecatini at the Stadio Menali. Kevin Foley played for 45 minutes in the Republic's friendly win in Pistoia, hours after being told he would not be going to Euro 2012. 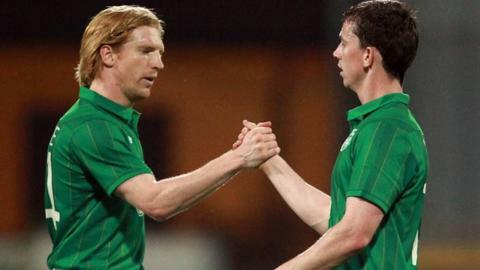 Paul McShane had been given the nod over the Wolves defender, who was introduced as a half-time substitute in the final 23 for Poland and Ukraine. The Tuscan team was a Serie C and D representative side put together by Ennio Pellegrini and Aldo Firicano, players once managed by Republic boss Giovanni Trapattoni. Keane set the ball rolling when he capitalised on an error by central defender Federico Settepassi to smash home a rising 18th-minute drive. The Republic skipper miskicked in front of goal three minutes later after Corrado Colombo, his former Inter Milan team-mate, had hit the post at the other end. James McClean saw a 24th-minute shot beaten away by Francesco Gaffino, who produced a fine save to keep out Cox's effort from Stephen Hunt's cross, only for the striker to fire home the rebound. Keane netted a second goal after a slick build-up between Paul Green and Cox 14 minutes before the break. Keane, McClean, Richard Dunne and Keiren Westwood made way at half-time for Walters, Foley, David Forde and Long, with the West Brom frontman hitting the bar within three minutes of his arrival. Forde had to get down well to keep out a 54th-minute strike from Gianluca Bugelli, but Long made it 4-0 after beating the offside trap 10 minutes later. Green smashed a long-range 80th-minute shot wide after exchanging passes with Long, but Walters completed the scoring four minutes later after Foley's free-kick was parried by substitute goalkeeper Tomasso Strambi. The proceeds from the game were donated to a charity in memory of the late Livorno midfielder Piermario Morosini.